NEW YORK (CelebrityAccess MediaWire) — MarketResearch.com announced their report which forecasts the U.S. music streaming market to grow at a CAGR of 20.5% between 2014-2019, driving market value to $2,780.1 million by the end of 2019. With last week's publicity on Taylor Swift and Apple, it's no surprise that online music streaming gained more attention. Online music streaming is growing and evolving in the U.S. and globally. 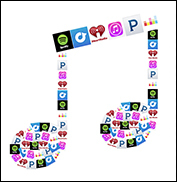 According to a report by publisher TechNavio, global music streaming by key vendors such as Apple, Deezer, iHeart Media, Spotify, Pandora, and more is expected to grow at a CAGR of 12.57% over the period of 2014-2019. On a more local level, publisher MarketLine has found that music screaming in the U.S. has an anticipated CAGR of 20.5% for the period of 2014-2019. Many artists are expecting a cut of royalties from subscription-based online music streaming. For 2014, the subscription services segment of online music streaming reached revenues of $799.0 million, equivalent to 73% of the market's overall value.